The second annual Crown Isle Christmas Walk will be bigger and better this year, say organizers. Admission is free with donation to the Comox Valley Food Bank. The drive up the hill to the Crown Isle Golf Club is always quite magical—with the trees adorned with white lights in the fall and winter and a riot of colorful flowers in the spring and summer. But for Christmas 2015, the crew at Crown Isle took the magic to a whole new level. With the support of their staff and more than 30 volunteers, the area around the clubhouse was transformed into a winter wonderland as they staged the First Annual Christmas at Crown Isle Resort Walk, in conjunction with the ever-popular 14th annual Gingerbread Village and Teddy Bear Basket exhibit and silent auction. Despite a rainy and slow start, by the time the 2015 event wrapped up, the month-long Christmas extravaganza had attracted more than 6,000 visitors and generated more than $12,500 for local charities. Based on the Resort Walk’s success, and fueled by the excitement of the community, Crown Isle Resort plans to make this year’s Resort Walk and Gingerbread Village even better. 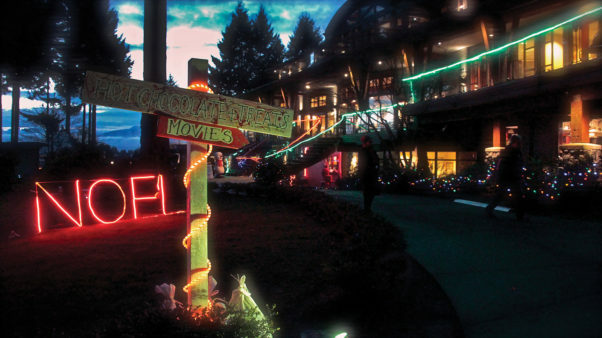 With more lights, more activities and a bigger and better line-up of displays, Crown Isle expects that this will become the premier family-friendly community Christmas event in the Comox Valley. Given good weather, they hope that attendance numbers will double, which will also significantly increase the amount raised to support local non-profits. According to Jason Andrew, Director of Real Estate at Crown Isle, the idea for the Christmas Resort Walk started rather modestly, with a few lights and decorations being set up outside of the clubhouse. Then it morphed into a full-blown festive affair that was generously supported not only by the public, but many local businesses, such as Quality Foods, the Comox Valley Record, the Echo, The Eagle Radio, The Goat Radio, and more. Andrews explains that the Crown Isle Christmas experience starts as people drive up the hill past thousands of sparkling Christmas lights. For just the cost of a can of food to donate to the Comox Valley Food Bank, visitors can expect to be welcomed by a greeter, directed to park, and then encouraged to meander around the exterior of the clubhouse to see all of the different displays as Christmas music fills the air. Crown Isle residents and Golf Club members Eveline and Roger Shaw had fun helping with the decorating at last year’s Resort Walk and plan to volunteer again this year. For several weeks, staff and volunteers painstakingly created and installed the Resort Walk displays. There are lots of larger than life plywood cutouts, ranging from the Grinch to the Abominable Snowman, and tens of thousands of Christmas lights. Themed activity stations include a kid’s village, candy cane lane, Santa’s workshop, elf lane, plus a kid’s holiday cinema with Christmas movies playing non-stop. There will be several fire barrels burning through the property, to warm fingers and toes, as well as a S’mores station, hot chocolate and other goodies to fuel hungry tummies. Santa, of course, is also in attendance, and he sets up in the beautiful white gazebo. The Christmas Tree Trail is a new addition this year that is sure to be a crowd pleaser—and a good money generator that will further support the four chosen charities. Crown Isle provides the trees, tree stands and signage, and community residents and businesses are invited to purchase the sponsorship of a tree for $100 and then decorate it for all to enjoy. Visitors will vote for their favorite tree and the People’s Choice winner will receive an exclusive golf and accommodation package at Crown Isle. 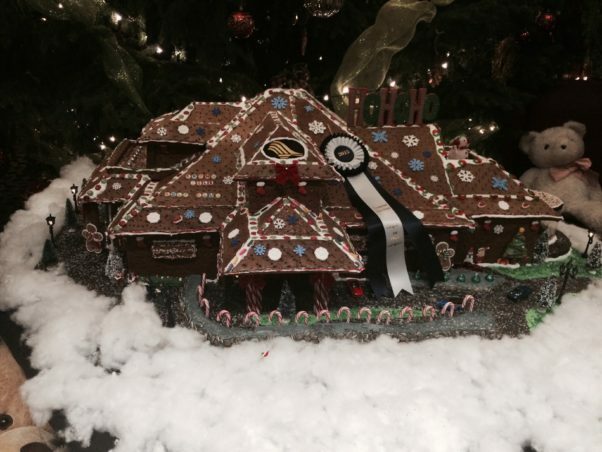 When kids (and adults) have burned off their energy exploring the outdoor festivities they are welcome to head inside the Crown Isle Clubhouse to marvel at a display of close to 100 gingerbread creations and ingenious teddy bear baskets. Mary Ruth Harris has played a key role in organizing the Annual Gingerbread Village and Teddy Bear Basket exhibit for several years. She explains that it was started by a group of volunteers and was designed to be both a fundraiser and an opportunity for community engagement. The founding and title sponsor was the Courtenay office of Odlum Brown Investments. Due to its ever-increasing size and scope, this exhibit has been hosted at several locations over the past 14 years, including the Comox Centre Mall, the Filberg Lodge, the Old House Hotel, the Courtenay Museum and Crown Isle. While Odlum Brown has withdrawn their sponsorship to focus on other community projects, Crown Isle has stepped up to host the event going forward, and the focus remains the same. There are three categories for the gingerbread building and one for teddy bears. Exhibitors pay an entry fee (that goes to charity), and the displays are sold to the highest bidder through a silent auction. Both businesses and individuals are welcome to participate to compete for the coveted People’s Choice Award and prize ribbons. Entries will be accepted November 25th through 27th between 9:00 am and 6:00 pm. Anything goes when it comes to the Gingerbread Village creations, like this one of the Crown Isle Clubhouse last year. Visitors can see the Gingerbread Village and Teddy Bear Basket displays from November 28 through December 17. While the ratio of gingerbread creations and teddy bear entries varies each year, Crown Isle guarantees that visitors will be amazed at the originality of all of the entries. The gingerbread creations are no less spectacular. From Kit Kats to Jube-Jubes, gingerbread to Graham crackers, anything goes as far as ‘construction materials’ on each two-foot-square display space. Last year Crown Isle Resort’s chef made a replica of the clubhouse. Expect to see other local landmarks, Nativity scenes, Santa’s workshops, cartoon characters, and more. Last year, cash donations at the door, entry fees and the silent auction raised $12,500, which was equally divided between four local charities. This year, non-profits that will benefit from Resort Walk fundraising will include the Comox Valley Food Bank, the Boys and Girls Club of Central Vancouver Islands, Dawn-to-Dawn Action on Homelessness Society, and the Comox Valley Transition Society. Visit the Crown Isle Gingerbread Village and Teddy Bear Basket displays seven days a week from November 28 through December 17 from 9:00 am-9:00 pm. Enjoy the Resort Walk and Community Tree Trail December 2-4 and 9-11 and then daily from December 16 through 23, from 5:00 to 9:00 pm. All events at the venue are wheelchair and stroller accessible.